We have recently collated our statistics dating back to 2014, the date where we essentially reopened our advice giving and representing capacities after a brief period of closure. We are proud to say that our success rate in asylum and human rights appeals are almost double the national average, as per the quarterly statistics for 2018 provided by Refugee Council. When an asylum seeker arrives to the United Kingdom in order to seek refuge from persecution in their country of origin, they must apply to the Home Office in order to claim asylum. It is here where the first decision is made on their case, by Home Office caseworkers. However, very little asylum claims succeed at first instance. In fact, 68% of the Home Office’s decisions in 2017 were refusals. The asylum appeals process thus remains a vital safeguard against poor decision-making and the main obstacle standing in the way of individuals being wrongly returned to countries where they face serious risk or even death. 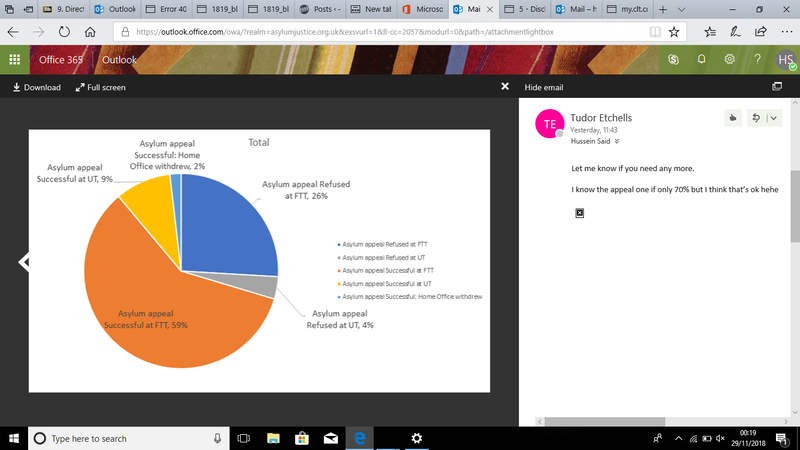 In terms of raw numbers, the average success rate of an asylum appeal in 2018 was 37%, while the average success rate for an immigration appeal was 50%. 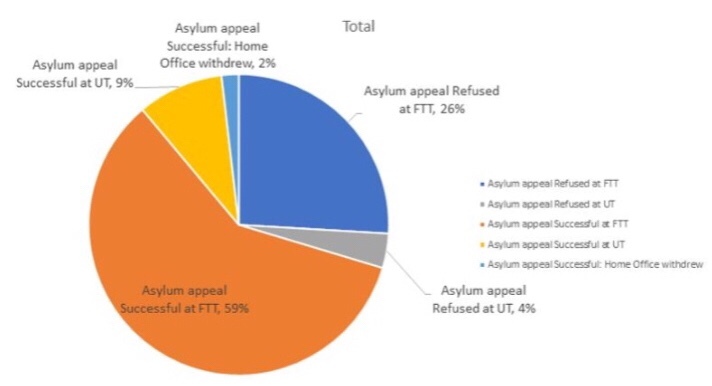 In spite of the number of appeals overturned, a growing number of asylum seekers are unable to secure proper access to the asylum appeals system. During the last decade, a shortage of legal aid solicitors in Wales and stringent ‘merits’ tests imposed by the Legal Aid Agency have seen a growing number of asylum seekers refused legal aid to appeal against being refused asylum. We take on the appeals of asylum seekers denied legal aid on the grounds that solicitors considered their case too ‘weak’ to win on appeal. Asylum Justice therefore takes on the ‘hardest’ cases, yet we win 70% of them. This demonstrates the quality and integrity of our work. 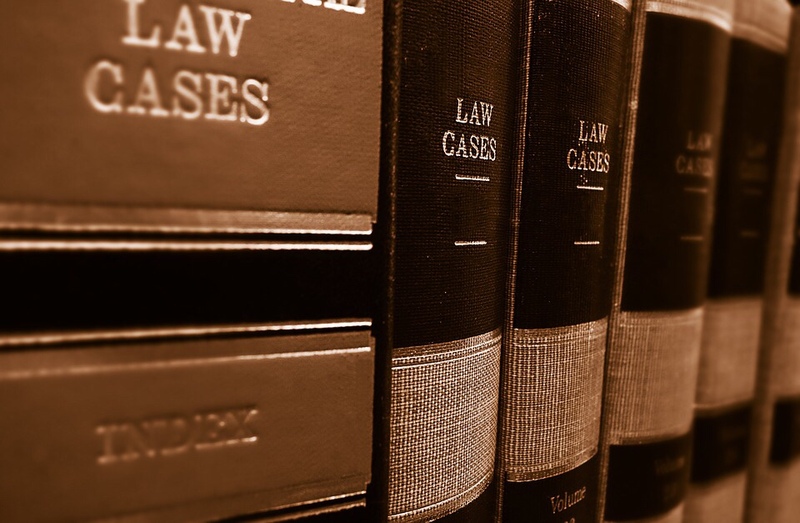 In taking cases which have been deemed too difficult to win, we ensure that the asylum seeker is represented irrespective of the perceived strength of their case. And in doing so, we provide the highest quality of legal representation, often preparing and representing their case at appeal. This is a testament to the quality and dedication of all the lawyers at Asylum Justice, but especially so to our Legal Director, Ruth Brown, who in the beginning, would do much of the appeal work and family reunion applications herself. Yet, she still won numbers well above the national average, and crucially kept the vital services of Asylum Justice open to the most vulnerable. Please donate to allow us to continue this vital work as the only charity in Wales able to do so.